Ken's recent paper on a fascinating and clinically-relevant aspect of alveolar rhabdomyosarcoma biology has just been accepted to PLoS Genetics. Co-authors included lab alumnist Imran Aslam (now a medicine resident at Johns Hopkins), OHSU collaborator Wolfram Laub, UTHSCSA collaborator Joel Michalek, Harvard collaborators Simone Hettmer and Amy Wagers, JHMI collaborators David Loeb and Bree Wilky and Cleveland Clinic collaborator Brian Rubin. This is Ken's 8th paper (and 6th first author paper) from his 2 year postdoctoral fellowship in our lab (with one additional first author manuscript soon to be submitted). Amazing productivity for Ken, who is now faculty at Uji Takeda Hospital and Kyoto Prefectural University. The study above was made possible by funding from the NCI. Eri & Ken's co-first author study of the role of the retinoblastoma gene in rhabdomyosarcoma has been accepted to the journal, Skeletal Muscle. Co-authors include lab members Noah, Jinu and Matthew; lab alumni Olivia, Elaine and Koichi; as well as collaborators Ayeza & Atiya (OHSU Pathology), Sherrie (Univ of Utah), Paul & Sean (NCI), Harry, Lee Ann Chris, Yidong and Joel (UTHSCSA), Brian (Cleveland Clinic) and Monica (IMPPC, Barcelona). This work was made possible by a gift from the Nylund estate and fellow funding to Jinu and Koichi by the Scott Carter Foundation. Would members of the community be interested in sponsoring an experiment to launch drug discovery in rhabdomyosarcoma? 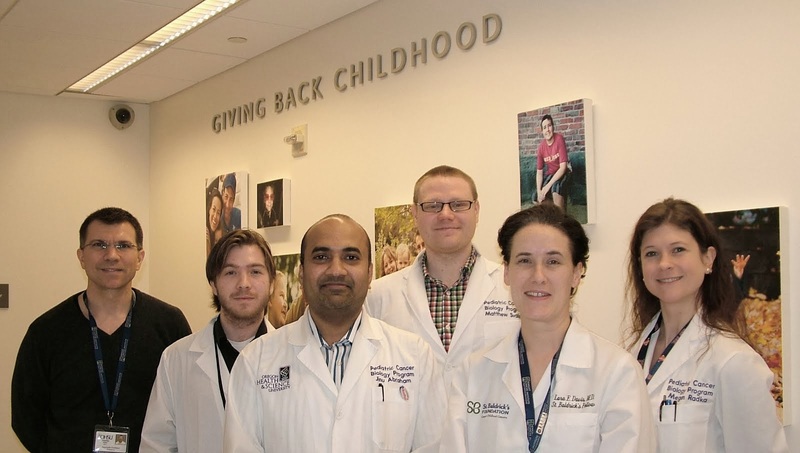 We are experienced in building drug screens from our leadership of the international dipg preclinical consortium and now want to build the resources to do the same thing for rhabdomyosarcoma. We need $16,000 to build the rhabdomyosarcoma-specific 60 drug screen. Thereafter, screening each new tumor culture would cost approximately $600. In parallel, we have an unusual set of other compounds which our lab members call, "Strange Brew." There's no other way to explain this set of compounds, which draw upon every unusual observation of cancer and muscle biology since the early 1900's. This higher risk screen is a $21,000 project... we could really use a sponsor for this second project as well. Plates from both screens would not only be used by our lab, but also distributed to rhabdomyosarcoma research labs in the U.S. and internationally. We have a good feeling about this.